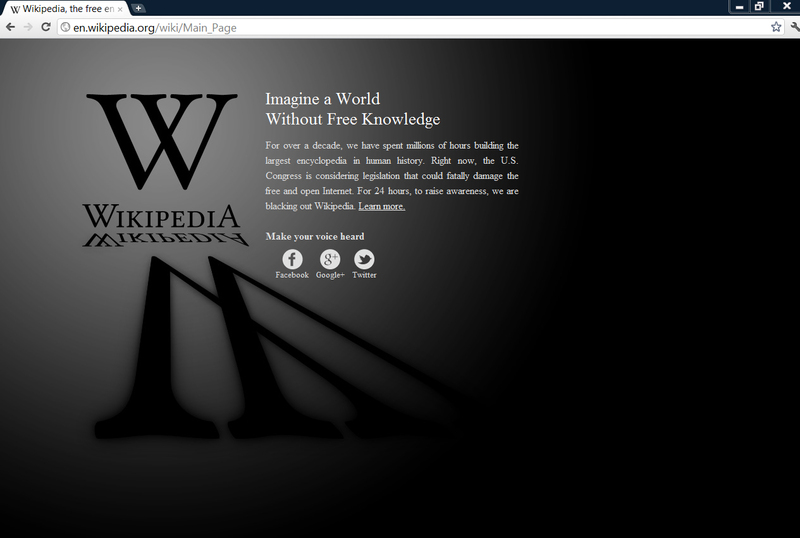 The Stop Online Privacy Act (SOPA) got a lot of attention yesterday – especially the wikipedia blackout. Many outlets oppose the bill because they fear, rightfully, that it will promote censorship and stifle free speech and internet innovation. It seems protest and outrage got to enough congresspeople to keep them from supporting some of the worst aspects of SOPA, but the cornerstone of advocacy is support for strong intellectual property and copyright laws themselves. Constitutionally, copyright power is designed “to promote the Progress of Science and useful Arts.” Industry advocates and their allies consistently rely on a theoretical case that without strong intellectual property protection advances in science and art would be practically nonexistent and entertainers would all starve. It all sounds nice in theory, but the only thing nonexistent for this state of affairs is the evidence for it. I’m sure printers of the Encyclopedia Britannica may have lost some revenue after the internet and wikipedia started offering information freely, but can anyone seriously claim that information is less available now? As an author of a free blog, maybe I just can’t understand. I suppose it’s possible that we’d descend into an artistic Dark Age if we greatly reduced intellectual property rights… but somehow we got by with Shakespeare, Mozart, and Da Vinci before copyright laws made innovation itself possible. Matt Yglesias sensibly wonders what problem needs fixing? There are plenty of books to read, things to watch, and music to listen to. Indeed, the American consumer has never been better-entertained than she is today. The same digital frontier that’s created the piracy pseudo-problem has created whole new companies and made it infinitely easier for small operations to distribute their products. Digital technology has reduced the price we pay for new works and made them cheaper to create. I can watch a feature film on my telephone. Instead of tightening up IP laws we should be moving in the opposite direction. If we start to create a real problem, we can move back, but cutting into an industry’s profits by failing to provide them total monopolies shouldn’t be a concern for public policy. Only to the extent that lack of profits decisively cramps innovation do we need to interfere with the free market. Even still, copyright isn’t the only option; government, universities, and charity can fund the arts and science or we could modify the tax code to further promote art. I’m usually against more complications to the tax code, but the monopolies copyrights create distort efficiency far more than a tax credit. A refundable tax credit for a specific amount (e.g., $100) that individuals could contribute to whatever creative worker/organization they choose. The condition of getting this money would be that the recipient individuals/organizations would not be eligible to receive copyrights for some period of time (e.g., three years) after receiving the money. All the work they produce would be in the public domain so that it could be reproduced and circulated around the world. Entertainers can still make money from concerts, merchandise, advertising, appearances and other creative endeavors so I don’t think we have to worry about Jay-Z ending up back on the streets if IP rights aren’t fully enforced. I know everyone fears that without strong copyright great artists like Angelina Jolie and Channing Tatum will go extinct once they’re unable to afford eating desserts made of real gold at award shows, but something in me guesses we’ll still have movie stars and we’ll still be able to watch movies. *Without intellectual property protection I would have never wrote this blog post. Someone suggested that it was “patently absurd” to believe that Obama et al would pass a constitutional law. Is that devious or naive? There’s definitely an argument to be made about the strength of our IP laws (and I definitely think copyright law, in particular, has gotten out of hand in this country), but your post seems to be arguing that we shouldn’t have any IP protection at all (correct me if I’m wrong, of course). I can’t really get behind that. Copyright law promotes the arts by giving artists a financial incentive to create. Certainly artists would still produce art without the monetary prompt, but I think it’s logical to assume fewer would feel motivated to do so if they couldn’t be guaranteed a financial return on it. Jay-Z’s career might have gone differently if every other rapper to hear one of his songs could have started performing it themselves. And I doubt Hova could have relied on getting the the patronage that funded Shakespeare, Mozart and Da Vinci. Your argument also focuses exclusively on the copyright side of the equation and neglects patents and the protection of invention- the “sciences” part of the equation. Would Apple have given us so many neat devices if they knew Microsoft would be selling iPhones within a week of their release? I’m not arguing that we shouldn’t have any IP laws, but I do want to hack away at the theoretical justification for them. I can only ever seem to find strong hypothetical arguments; actual evidence of their necessity is hard to come by for copyright at anywhere approaching the levels they exist in today. Like I said before, I keep hearing that copyright gives artists financial incentive to create, but artists created a lot of art before copyright law. I believe it does give them incentive but I don’t think it’s a vital incentive. Artists can be inspired to create for art’s sake and can get financial incentives through charity, government, schools, and non-copyrighted commerce. Touring is hugely lucrative for the top-artists. Do you think Hova is just going to give up the $500k/show he reportedly makes because he doesn’t get quite the amount he earns now from his government provided monopoly on songs? Should we start banning cover bands too? Jay-Z’s fortune isn’t only from selling copyrighted music, he’s used his success in music to become a successful entrepreneur. And imagine if IP prevented other musicians from using non-original music? How did Jay-Z become the CEO of hip-hop anyway? A hostile Takeover. The strictest copyright would blackout The Grey Album and would muzzle Girl Talk. Who’s to say liberalizing IP wouldn’t lead to a proliferation of more art? It’s difficult to appreciate music and technology that’s not made because of IP law. Sure, we have wonderful iPads and iPods partially enabled by IP, but think of the gadgets that other companies and tinkerers could create using the base tech invented by Apple and other companies. Inventors benefit from “sampling” just as much as musicians. Okay, so we’re not really that far off, you and I. But I still think there are a couple points to your answer that I’d like to touch on. First, I suggest to you that copyright protection is more than a mere financial incentive. It is also a protection of authorship. Let’s say I were to start stealing all of the posts you make on this blog- I set up a program that immediately cut and pasted your words onto my own blog- and claimed them for my own. It’s possible you might not mind- maybe you’d be flattered, or happy for the expansion of your ideas. But they wouldn’t be your ideas. To anyone reading my blog, they would be my ideas. And you would have no legal recourse to do anything about it. Other mechanisms do exist for enforcing a “don’t steal ideas” cultural norm- see standup comedy and high-end cooking- but those mechanisms do not work perfectly and I don’t want to assume you think that would work for all artistic endeavor. What if my friend Ernest showed me a manuscript he’d just finished? He’s spent years on it; painstakingly editing it down to reflect his voice, a voice he thinks will define a generation. He gives it to me to see what I think. But, rather than edit it, I run to the nearest publisher and publish it under my name. I call it, A Goodbye to Guns. Now, of course, neither of us stand to make much money off the sale, since anyone who has access to the contents can copy it to their hearts content (even Xerox the whole thing and pass it out on the street for free), so why pay for the book? But even setting the money aside, Ernest will have a tough time convincing the world he’s the source of those beautiful words. The same could have happened to Jay-Z. See, the problem I have with your Hov example is that is presupposes his success. He had to rise to fame before he could take over anything. And if record companies could just send agents to underground clubs to record every hot new song to hand off to a known quantity to perform, Jay might have just vanished back into the Ether. As for Girl Talk, the reason why he’s still around is because he does fit within the copyright regime as it exists today, at least so far. Girl Talk’s music is protected under a doctrine called “fair use,” which- not to get too technical- allows for a little infringement if done in specific ways and/or for specific purposes. And Girl Talk knows this- if you ever read an interview with him, he beats fair use like a drum (pun intended). And the record companies know this, which is exactly why they haven’t sued him yet. Which isn’t to say they would definitely lose, they might win, but he has a good enough case and enough high-level IP scholars and lawyers at his back that, thus far, they’re afraid to try. Turning finally to patent: yes, sampling is valuable in science, too. But one of the nice things about patents is that they don’t let scientists get lazy. Because they’re not allowed to simply copy, they’re forcing to come up with something new, to innovate. That’s why there are currently a dozen different tablet computers on the market right now, instead of a dozen iPads. A little competition and variety is good. And patent accomplishes other things, too. It encourages disclosure. In order to benefit from the temporary monopoly that is your reward for invention, you are forced to publish the specs to the invention. That means that getting patents encourages Apple to put its designs and innovations out into the public sphere of knowledge, for everyone to enjoy eventually, rather than forcing Apple to protect its designs the only other way it could, by using trade secrets. Keeping innovation secret retards the spread of knowledge. Thus, patents encourage the growth of public knowledge. Again, your argument assumes that I’m totally against all IP protection. As I said, I’m not. But I think their benefits are wildly overestimated. I’ve heard all of these justifications before, but until we see some actual evidence that IP protection at this level is somehow at the ideal equilibrium for encouraging innovation I think our bias should be toward liberalizing IP protection not tightening it. A quick note on your thought experiment. I think it’s far fetched to think I couldn’t prove the words were originally mine. My blog is the best evidence – I could screen capture exact times of posting if someone started trying really hard to take credit. Chances are that without the benefit of legal protection, I’d still be able to ruin the reputation of someone plagiarising me. I doubt I’d have the money to sue someone now with all the laws in place; but, reputation is a powerful safeguard against abuse. Also, any rap thief would be exposed pretty quickly. You can’t fake Jay-Z’s delivery and voice and it’d be pretty curious when the fraud’s talent dries up when he’s not able to have immediate access to Jay-Z’s musical reservoir. That said, and to play devil’s advocate a bit, even if someone did successfully appropriate my content it’s not self-evident that’s bad for the general population (which is the point of copyright after all). If Ezra Klein or some HuffPo writer copy and pasted my words on their sites, my ideas would be reaching a far wider audience and would have a greater chance of persuasion – and isn’t that the point of making arguments anyway?